A fellow patron at Arzak, a renowned restaurant ranked #8 on the World’s Best List and featured in a wonderful documentary entitled “Three Stars” (well worth watching), was making copious notes of each course. 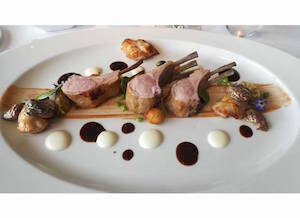 He told me he had been coming to the restaurant in Spain’s Basque region for years, but this time he was writing a review for a regional paper. (He is also a vintner from the Bordeaux region of France — about two or so hours north of San Sebastian.) This area has everything going for it to be a culinary dream-come-true: great purveyors of fresh produce, basically on the sea for fresh fish, and remarkable cattle ranchers. Then there’s the wine and olive oils. Put all those elements together and this is a foodie’s paradise. We hadn’t even provided our names as we entered, but the hostess knew who we were. Likewise, at the end, our car was delivered without as much as asking for or producing a ticket (none was given). And the final touch was receiving the printed menu given to each and every guest with the listing of all their unique courses and wine. This is a good thing because I could never remember so many complicated presentations. The photos are a trip down memory lane. Suffice it to say, hands down the thing I will never forget was a presentation of sea bass. First an iPad-type of device was placed in front of me playing a video of crashing waves, and then the see-through glass plate was placed on top so one is reminded of the food’s origins. Really. Who thinks of these things? Another memory was watching a napkin being refolded in the patron’s absence deftly using only spoons — no touching allowed. That was pure class. The Hotel Maria Cristina is a beautiful, Beaux-Arts type of structure — indeed it was once inhabited by Spanish royalty. 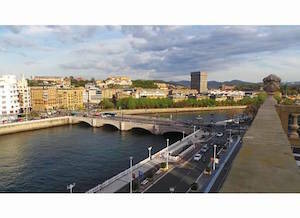 It is a few short blocks to the historic area of this seaside town, with narrow streets filled with lively bars offering pintxos, the actual name of tapas. Try as we might, we still couldn’t figure out the system of ordering and paying. Everything looked fresh and appetizing, to be accompanied by a beer or glass of wine while watching ubiquitous soccer games. 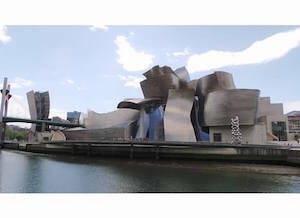 A great and impressive site is the Bilbao Guggenheim Museum, a one-hour drive from San Sebastian. To my mind, the art is appreciated as much for its scale as anything else — massive installations are typical. But it was the building that was breathtaking and absolutely worth the journey. The Jeff Koons flowering dog in front of the complex defies description as well. Continuing our gastronomic extravaganza in the region, we dined at Martin Berasategui, again for a lunch lasting more than two hours. The chef/owner/proprietor obviously is committed to his craft, as he “lives above the store.” And some kind of store it is, to be sure. We were greeted before even making it up the steps by a lovely woman who took our photo in front of the bronze name plate. Once inside the spacious and elegantly appointed room, the service was serious but not stuffy with everything “as you wish.” The hubby perused the extensive wine list and selected an excellent French red for 50 euros (approximately $56), a good price considering the surroundings and offerings. I now know the reason this area is so unique and so concentrated with remarkable restaurants.